It’s official. Barisan Nasional is hell-bent on wresting back Selangor from Pakatan Rakyat. It was reported by Bernama on 26 July that the Selangor UMNO has been asked to hold information campaigns under the Conquer Selangor Initiative Programme (Pintas) in all 56 state constituencies in Selangor beginning August. This might have been an official declaration of intent by the BN-UMNO but everyone knows the campaign to discredit and persecute Pakatan Rakayat elected representatives in Selangor started soon after they took over the state. In a press conference attended by 10 Pakatan state assemblypersons, Sekinchan rep Ng Suee Lim referred to the ISA arrest of Seputeh parliamentarian Teresa Kok as the first step in the BN-UMNO campaign and the subsequent arrest of Selangor Exco and Pandamaran state rep Ronnie Liu, who was accused of “obstructing” enforcement officers from carrying out a raid on a budget hotel in Puchong in 2007. Selangor Menteri Besar Tan Sri Khalid Ibrahim was next when he was accused of using state funds to maintain his personal car and to purchase cattle for his constituency of Bandar Tun Razak during the Hari Raya Haji celebrations. Next, a number of “indecent” photos of Bukit Lanjan state assemblywoman and Exco Elizabeth Wong were circulated, putting her through emotional hell as the BN propaganda machinery went into overtime and vilified her all over the mainstream media. Wong had wanted to resign over the issue due to intense pressure but the Pakatan government decided not to cave in to the BN’s dirty tactics and Wong resumed working. On top of that, the fact that two assemblymen have “charges” against them — Kg. Tunku rep Lau Weng San for “illegal assembly” on 10 November 2008 and Ronnie Liu for “illegal assembly” on the same day as well as abetment in obstructing a public servant from doing his duty — and could well be convicted if the forces that be wish so, will certainly fuel more conspiracy theories with regard to the alleged witch-hunt being perpetrated by BN-UMNO. The shocking and tragic death of political aide to Exco Ean Yong Hian Wah, Teoh Beng Hock, may or may not have been part of any grand plan by BN-UMNO but it has certainly put Selangor under the microscope. Will Selangor be another Perak and be toppled by a desperate and ruthless regime with no regard for democratic principles and any sense of integrity or decency? Even before Teoh’s family could settle down and grieve privately for him in their own way, malicious blogs have sprouted all over cyberspace with allegations that link Teoh’s death to Ean Yong and Liu, whom the blog accuses of siphoning constituency funds. Titled “Truth For Teoh Beng Hock”, it was obviously created with malevolent intent and meant as a character assassination attempt on the two DAP assemblymen. It also pointed the finger at one Wong Chuan How, “purportedly” a contractor and the major beneficiary of projects and contracts awarded by Ronnie Liu. Wong is, in fact, a politician, special assistant to Liu for the Sg. Pelek area and a Sepang councillor. The reason cheques were made out to Wong was because he was one of Liu’s assistants and the main person handling miscellaneous payments for the majority of Liu’s projects, events and programmes. In any case, all payments paid out must be supported by documents such as invoices, receipts, vouchers and photographic evidence in order for the requests to be approved by the Land Office. A discrepancy in the blog’s contents was that, among the 84 projects (items 89 to 172) handled by Wong Chuan Chow, some of them were dated before March 2008, the last general election. As the blog claims that the list of projects were taken from Liu’s blog, how is it that both Ronnie Liu and Ean Yong had access to state funds when they had not even been elected as assemblymen? In addition to that, a number of the programmes and projects listed in the “documents” are works of fabrication. The allegation that funds were disbursed to buy hampers for village chiefs in Seberang Perai was not only far-fetched but downright ridiculous. It is unthinkable that the Land Office in Selangor would have approved funds for programmes outside of the constituency, let alone outside of the state. That the DAP took a cut of all the payments is a ridiculous accusation as the amounts were paid in full to the recipients and no complaint nor questions was raised by anyone on such matters until this particular blog surfaced. Other allegations on the blog were that many of the projects were “non-existent”, and that Ean Yong had used Wong’s name to claim money without informing the latter. In addition to that, the author claimed that Ean Yong had asked the late Teoh to make up the invoices, and putting in “agreed” amounts. To date, the author of the blog has not provided any concrete nor tangible evidence to support his/her allegations. Both Ean Yong and Liu have lodged police reports on the issue. 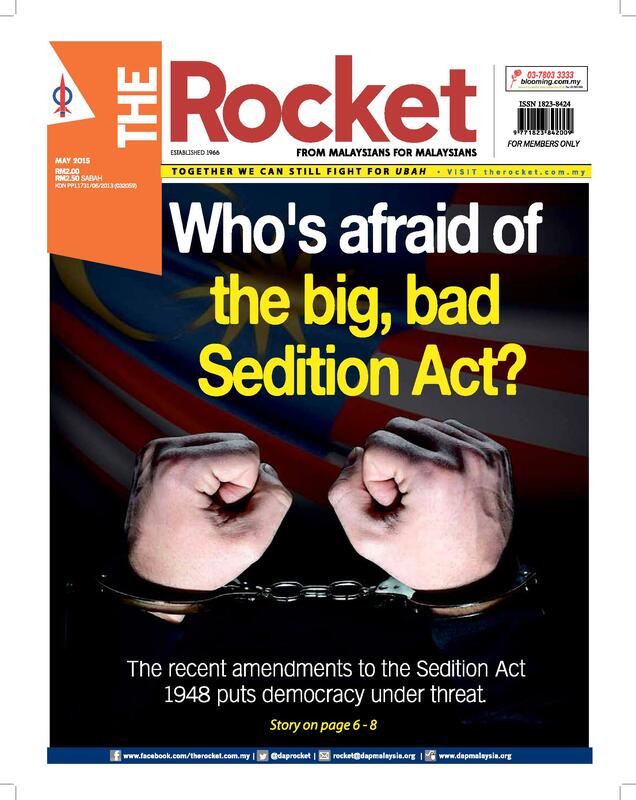 It is perhaps not surprising that Pakatan elected reps are being targeted in such a vicious manner as it is clear to all that BN-UMNO will stop at nothing to dislodge the Pakatan government. This article was written by admin on Thursday, October 15, 2009 at 3:49 pm. You can follow any responses to this entry through the RSS feed. Both comments and pings are currently closed.